Successfully Added Beelink BT3 Pro Mini PC - Windows 10, Intel Atom X5-Z8350, 4GB DDR3 RAM, 32GB Storage, Dual-Band WiFi, 128GB SD Card Slot to your Shopping Cart. With the Beelink BT3 Pro mini PC, you’ll be able to carry along your personal computer anywhere you go. With its abundance of ports that include an HDMI and VGA input, this Windows mini PC can be hooked up to virtually any external display. Once connected, it will turn the screen into your private PC. Thanks to its miniature size, you’ll be able to carry along this little beauty anywhere you go. From now on, any display at your disposal can function as a computer. This brings along great efficiency while working out of the office. Within its compact body, this licensed Windows 10 Mini PC packs the Intel Atom X5-Z8350 CPU. This processor has been clocked at 1.44GHz. It lets you enjoy all the basic Windows and office features without experiencing any lag. Additionally, your mini computer comes with 4GB DDR3 RAM and 32GB internal storage. In case you need even more memory, your mini PC supports a 128GB SD card slot. Thanks to this, you can be assured that you’ll never again run out of space to keep your files and media. By packing an Intel HD graphics’ card, this Windows 10 mini PC lets you enjoy great visuals. Besides browsing the web and writing up documents, your gizmo allows you to play basic games and watch the latest movies. Windows 10 is guaranteed to bring along a smooth user experience for you to enjoy. With Bluetooth 4.0 support, your portable mini PC lets you easily use it with your wireless speakers and keyboard to bring along extra efficiency. No matter where you are, from now on you can always access your files by turning any large display into your own computer. 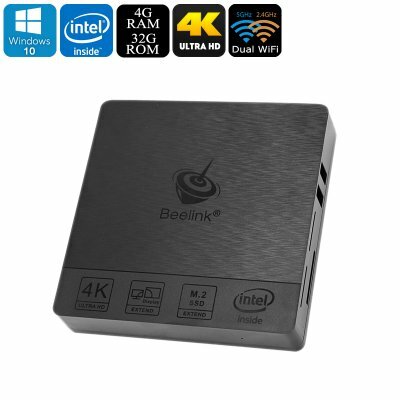 The Beelink BT3 Pro mini PC comes with a 12 months warranty, brought to you by the leader in electronic devices as well as wholesale mini computers..